In 1819, Diabelli provided a waltz theme and asked all the major composers of Vienna to compose a variation on the theme so he could compile all of them into a single Theme and Variations. Beethoven indignantly refused to write a variation on such a “Schusterfleck” of a theme, and then, in irritation decided to show what you could do with such a banal and not very charming subject by composing, not one, but 33 variations with a playing time of over 50 minutes; he even demonstrated his own brand of humor in that Variation No. 22 is not a real variation but a quote from Don Giovanni (“Hab kein Ruh bei Tag und Nacht“). 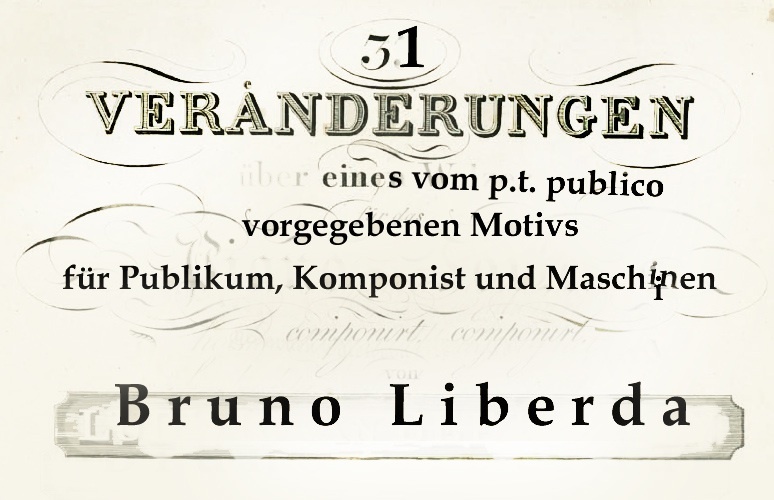 Now in 2014, Viennese composer Bruno Liberda, intrigued with this idea of finding such a wealth of material within a simple source, proposes to create 31 variations on a theme provided by the audience! All those who are present will witness the composition of a new piece. Audience members will improvise sounds using brooms, scissors, paper, piano, wire, bell, cellophane, porcelain and other instruments which will be distilled by the composer over the course of the performance into motifs that become 31 overlapping variations. Witness a new piece in the process of formation! Boundaries cancel… between emergence and the finished work, between a composer and an audience, between show and do. See, hear, and experience together the process of composition!